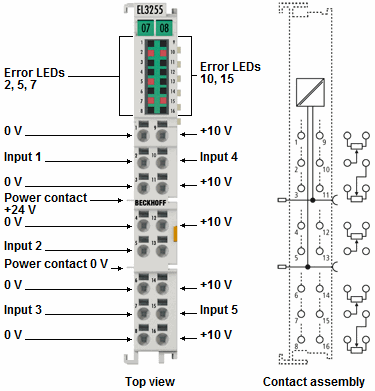 The EL3255 EtherCAT Terminal enables potentiometers to be connected directly. A stabilised power supply in the terminal and the ratiometric measurement of the input voltage offer the preconditions for precise measurement. On account of its high sampling rate and together with potentiometer position encoders, the compact 5-channel EtherCAT terminal represents an economical position detector.